As of June 2017, the Tampa Bay area water restrictions for all counties have been rolled back to watering lawns and landscapes to once a week. At ATZ Irrigation, we recommend a Sprinkler Check-up to ensure water conservation and to keep your lawn healthy. Our Sprinkler Check-up offering will test the irrigation system for malfunctioning or faulty components, adjust sprinkler heads and determine if the sprinklers are properly delivering a uniform distribution of water and determine any over-watering problems. When there is an abundance of frequent rainy days, a condition of too much water may occur. In this article, we will discuss over-watering by your sprinkler irrigation system. An over-watering condition affects specific areas of your landscape and can be harmful to your turfgrass, especially during a rainy period. Irrigation system over-watering is primarily caused by the first 6 items in the list below. The first thing you should consider is having a working Rain Sensor. A correctly operating Rain Sensor can save water and prevent over-watering. As your sprinkler system ages, irrigation system watering efficiency will degrade over time to a point where you are wasting water. The aging process and the damage to sprinkler components are due to nature and your lawn cutting services. Degraded watering efficiency can happen so slowly you may not be aware of it. Yes, even during frequent rain periods your sprinkler irrigation could be malfunctioning and over-watering different parts of your landscape. The effects can damage your yard or part of your lawn. Your grass, small plants, and flowers can be getting too much watering or even be underwater.Too much watering is not good and is harmful to your landscape. Florida grass needs between 1/2 inch to 3/4 inch of water one to twice a week. Cool-season lawns need even less water and can last four or five days between watering. The Irrigation System watering and daily rain fall can easily exceed 3/4 inch of water per week. We can’t stop the rain, but we can limit or shut off the irrigation system from adding water to the total the rain fall accumulation. 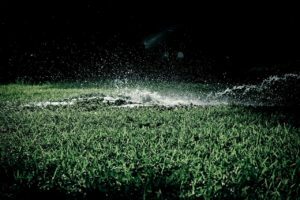 If your lawn or flowerbeds are soaked with water and have puddles that stay visible after 40 minutes or more, after watering, you definitely may have an irrigation over-watering problem. Also, the other obvious sign of over-watering is the appearance of water runoff as seen on sidewalks, driveways or streets after your sprinklers have completed a watering cycle. Over-watering creates an excess flow of water that carries soil nutrients and organic material out of the yard as runoff. Your turfgrass may be robbed of nitrogen and other vital nutrients. Due to the lack of nutrients, the grass may turn yellow or light green. ATZ Irrigation recommends a Sprinkler Check-up to determine if your sprinkler irrigation is working correctly and if you have an over-watering problem. Call us (727) 937-7177 for quick and reliable sprinkler repair services. Thatch: Thatch is a layer of partially decomposed grass cutting, organic debris, roots, and runner that create a dense fabric on top of the soil. Too much watering inhibits microorganisms from a breaking down this dense fabric. As a result, the thatch becomes thicker; the turf develops a shallow root system A shallow root system is bad because the turf is less drought persistent. As the thatch thickness exceeds an inch, less oxygen reaches the turf roots and becomes an excellent place for fungal and insect pests. Less thorough watering will reduce thatch because it encourages organic break down due to more oxygen accessibility. By eliminating over-watering the goal is to stimulate deep root development. The best time to remove thatch is early spring using a power rake or rotary mower. Fungus: Over-watering promotes fungal growth. An obvious sign of over-watering is the growth of mushrooms in the lawn. Also, another symptom of fungal growth is unhealthy looking yellow to rust colored grass known as Anthracnose. Anthracnose infects wet grass during hot and moist weather and causes irregularly shaped patches with leaf lesions that are yellow with black centers. Grass stem and sheath can rot during moist weather in the summer. It also infects ornamental plants, click on Anthracnose Disease of Ornamental Plants to learn more. Pests Breeding Ground: Over-watered yards are water saturated through the thatch area. Thick thatch is a perfect environment for the insects to breed. Wet thatch prevents insecticides from penetrating and allows insects to populate in a protective area. Insects such as white grubs that are the larvae of June beetles will feed on grass roots, wilt the grass and eventually kill the grass. Also, armyworms and cutworms chew and cut grass blades at the base and cause irregular bare patch areas to appear in your lawn. If your landscape has areas of standing water, it will be a breeding ground for misquotes. For help with outdoor pest control call Always Green..
ATZ Irrigation is available to help you with your sprinkler repair problem and prevent irrigation system over-watering. Call us (727) 937-7177 or complete our Quick Service Form.